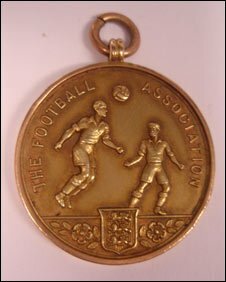 An FA Cup runners-up medal has been stolen from the family of the goalkeeper who received it in 1948. The medal was presented to the Blackpool goalkeeper Joe Robinson by King George VI after Blackpool were beaten 4-2 by Manchester United. It was stolen along with jewellery and watches in a burglary at the home of his son in Lower Withington, near Macclesfield, Cheshire, on 11 January. The gold medal is inscribed "J. Robinson. Blackpool FC 1947-48". It has two footballers and a football on one side and, on the other, the diamond-cut inscription: "The Football Association Challenge Cup - Runners Up". Pc Gary Turner, from Cheshire Police, said: "Joe Robinson, who played for Blackpool, Hartlepool and Hull City and was player/manager for Wisbech Town, passed away some time ago and the medal commemorates a very significant event in his life. "He was playing alongside the likes of Sir Stanley Matthews and Stan Mortenson and in front of a crowd of 100,000 fans. "Although Blackpool lost, the all-Lancashire match generated a lot of excitement. It is remembered as one of the greatest cup finals of all time. "The medal is obviously important to the family and its loss is a real blow to them. "I would like to hear from anyone who has any idea where it may be or from anyone who is approached by someone offering it for sale."